[S362] Raewyn Evans, "Email from Raewyn Evans (9/11/2003) #1," e-mail to Alan Bennett, 9 November 2003. [S2287] Website New Zealand BMD (http://bdmhistoricalrecords.identityservices.govt.nz/search/…) "1897/1692 Sarah Barrett Frank Thompstone." [S2287] Website New Zealand BMD (http://bdmhistoricalrecords.identityservices.govt.nz/search/…) "1872/11150 Thompstone Francis Roland." [S2287] Website New Zealand BMD (http://bdmhistoricalrecords.identityservices.govt.nz/search/…) "1926/4846 Thompstone William Henry 46Y." [S2287] Website New Zealand BMD (http://bdmhistoricalrecords.identityservices.govt.nz/search/…) "1878/11848 Thompstone William Henry Jane Francis Henry." [S2391] E-mails from Anne Evans to Alan Bennett, 2011 onwards "unknown cd." [S2287] Website New Zealand BMD (http://bdmhistoricalrecords.identityservices.govt.nz/search/…) "1917/2988 Jane Henrietta Eastwick William Henry Thompstone." [S2287] Website New Zealand BMD (http://bdmhistoricalrecords.identityservices.govt.nz/search/…) "1870/9403 Thompstone Eleanor Frances." [S3807] Website Facebook (www.facebook.com) "Discussions with Ann Evans." [S2287] Website New Zealand BMD (http://bdmhistoricalrecords.identityservices.govt.nz/search/…) "1899/4292 Eleanor Frances Thompstone Richard James Dooley." [S2287] Website New Zealand BMD (http://bdmhistoricalrecords.identityservices.govt.nz/search/…) "1900/5772 Dooley Mary Frances Eleanor Frances Richard James." [S2287] Website New Zealand BMD (http://bdmhistoricalrecords.identityservices.govt.nz/search/…) "1901/16591 Dooley Annie Bridget Eleanor Frances Richard James." [S2287] Website New Zealand BMD (http://bdmhistoricalrecords.identityservices.govt.nz/search/…) "1903/18191 Dooley Theresa Eleanor Frances Richard James." [S2287] Website New Zealand BMD (http://bdmhistoricalrecords.identityservices.govt.nz/search/…) "1904/15048 Dooley Joseph Patrick Eleanor Frances Richard James." [S3807] Website Facebook (www.facebook.com) "Discussions with Anne Evans." [S2287] Website New Zealand BMD (http://bdmhistoricalrecords.identityservices.govt.nz/search/…) "1899/14695 Eastwick Jane Henrietta Kate Ann George." [S48] Online index to the UK National Census for 1901 for UK "RG13/3725 f118." [S1051] Website Lancashire BMD (http://lancashirebmd.org.uk/) "C15/2/69." [S45] Website FreeBMD (http://freebmd.rootsweb.com/) "Marriages Mar 1894 Newnes Annie Salford 8d 63." [S45] Website FreeBMD (http://freebmd.rootsweb.com/) "Marriages Mar 1894 Thompstone Joseph Salford 8d 63." [S50] Website CWGC (www.cwgc.org.uk) "http://www.cwgc.org/cwgcinternet/casualty_details.aspx." [S3835] National Health Service Register for UK (online image) "Ref: RG101/4907B/017/37 Letter Code: NXPV." 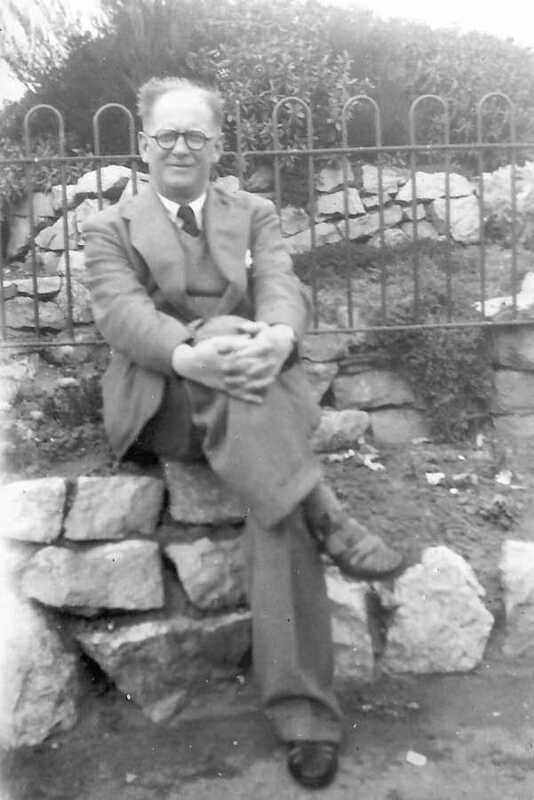 Leonard Thompstone was born in Manchester in 1897, to parents Joseph and Annie (nee Newnes). His father was a handicraft (woodwork) teacher. In 1911, Leonard aged 13, was living in Crumpsall, Manchester with his parents and siblings Sydney (15), a grocer’s apprentice and Harold (10). Corporal Leonard Thompstone passed through Peterborough East Station on 13 July 1916. He was with his comrade, Sergeant Herbert Potts, they were both serving with the 2/4th Battalion Seaforth Highlanders and he referred to them in the Visitor’s Book as “two kilties on their way from home to camp”. Camp would have been Blickling Hall in Norfolk where the Battalion was stationed at that time, before moving on to Kelling Heath and Cromer. Unfortunately, his service record has not survived, but it is known that he served with both the 4th and 7th Battalions Seaforth Highlanders and was awarded the British War and Victory Medals. Leonard married Emmie Griffin Adams on 7 February 1925, in the Wesleyan Methodist Victoria Chapel, Prestwich, Manchester. At the time of their marriage Leonard was living at 22 Hall Road, Crumpsall and working as a Public Trustees’ clerk. They had one son, Kenneth, born in 1927. Leonard died in November 1961, in Gatley, Cheshire, aged 64. Leonard’s older brother Sydney served with the 14th Battalion Royal Welsh Fusiliers and was killed in action in France on 20 October 1918. He is buried at Bertry Communal Cemetery, Nord, France. He was awarded the Military Medal." [S1051] Website Lancashire BMD (http://lancashirebmd.org.uk/) "C39/2/265." [S2260] UK National Census for 1911 for UK, "RG14PN23806 RG78PN1378C RD464 SD2 ED105 SN75." [S2309] Website Manchester Burials (unknown url) "22/03/1938 Thomas Alfred Thompstone Gorton Cemetery WConsecrated 300." [S2309] Website Manchester Burials (unknown url) "27/07/1954 Emma Thompstone Gorton Cemetery WConsecrated 300." [S45] Website FreeBMD (http://freebmd.rootsweb.com/) "Births Dec 1896 THOMPSTONE Frank Salford 8d 75." [S45] Website FreeBMD (http://freebmd.rootsweb.com/) "Death Sep 1957 THOMPSTONE Frank 60 Manchester 10e 98." [S70] General Record Office Indexes "Birth Mar 1922 THOMPSTONE John BRENDRITH Chorlton 8c 1241." [S45] Website FreeBMD (http://freebmd.rootsweb.com/) "Death Dec 1957 THOMPSTONE Frances 61 Manchester 10e 499." [S45] Website FreeBMD (http://freebmd.rootsweb.com/) "Births Sep 1902 Thompstone Alfred Francis Chorlton 8c 826." [S70] General Record Office Indexes "Marr Mar 1926 THOMPSTONE Alfred F WEIGHTMAN Manchester S. 8d 47." [S70] General Record Office Indexes "Marr Mar 1926 WEIGHTMAN Gladys M THOMPSTONE Manchester S. 8d 47." [S70] General Record Office Indexes "Death Jun 1950 THOMPSTONE Alfred F 47 Manchester 10e 394." [S45] Website FreeBMD (http://freebmd.rootsweb.com/) "Births Dec 1904 Weightman Gladys May Chorlton 8c 723." [S2309] Website Manchester Burials (unknown url) "116/04/1934 George Thompstone Gorton Cemetery WConsecrated 300." [S3829] Website Find A Will (https://www.gov.uk/search-will-probate) "THOMPSTONE HORACE 08 October 1997 9751915614 14 August 1997 Grant only Manchester." THOMPSTONE Ada Hall Manchester 8d 210." [S2309] Website Manchester Burials (unknown url) "04/02/1982 Ada Hall Gorton Cemetery WConsecrated 300." [S2309] Website Manchester Burials (unknown url) "22/03/1985 Norman Hall Gorton Cemetery YConsecrated 476." [S45] Website FreeBMD (http://freebmd.rootsweb.com/) "Births Sep 1875 Thompstone Fred Salford 8d 25." [S1051] Website Lancashire BMD (http://lancashirebmd.org.uk/) "C46/2/194." [S45] Website FreeBMD (http://freebmd.rootsweb.com/) "Births Sep 1900 Thompstone Stanley Hayfield 7b 874. [S45] Website FreeBMD (http://freebmd.rootsweb.com/) "Deaths Dec 1900 Thompstone Stanley 0 Hayfield 7b 512. [S45] Website FreeBMD (http://freebmd.rootsweb.com/) "Births Dec 1902 Thompstone Elsie Salford 8d 78. [S45] Website FreeBMD (http://freebmd.rootsweb.com/) "Births Jun 1904 Thompstone Gladys Bury 8c 568." [S70] General Record Office Indexes "Death Dec 1909 THOMPSTONE Gladys 5 Chorlton 8c 500."